A book perhaps for those with enquiring, open minds, for those willing to suspend disbelief – otherwise it would be quite difficult, nigh impossible to get past the premise of depression personified as a walking, talking, beer drinking black dog. It is July 1964 and Winston Churchill faces the abyss as he approaches his retirement, a time which, free from the distraction of work, will open the door to the likes of Black Pat, the huge, menacing black dog who darkens his mood and encumbers him both mentally and physically. Meanwhile, Esther Hammerhans, opens the door to Black Pat who presents himself as a potential lodger in answer to her advertisement. Two very different characters but linked by Black Pat who is inexplicably drawn to their doors. Will Black Pat “win” and succeed in blighting both of their lives? Mr Chartwell is the most original literary treatment of depression I have ever read. Somehow, Rebecca Hunt manages, in this, her debut novel, to never let events fall into farce and allows the reader to see how close comedy and tragedy actually are. There are equal amounts of humour and misery here, even the personification of depression, Black Pat himself, is not averse to the odd joke, the cheesier the better! The author really captures the oppressiveness and sheer weight of depression in the hulking figure of the black dog and even captures the love-hate nature of depression where the attraction of misery and self absorption seems so much more potent than the notion of engaging with other people. Esther finds herself growing accustomed to Black Pat’s presence, wearisome though it is – misery loves company after all! Hunt’s use of language is refreshingly original, her lightness of touch renders such a serious topic all the more accessible. 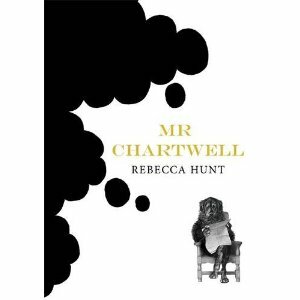 I was very impressed by this debut novel, I hope Rebecca Hunt continues to take risks in her subject matter and writing style as I really enjoyed the clarity and honesty of Mr Chartwell. This entry was posted on Friday, January 7th, 2011 at 8:04 am	and is filed under Historical Fiction, Literary Fiction. You can follow any responses to this entry through the RSS 2.0 feed. You can leave a response, or trackback from your own site. I have read about this before and I have to admit I’m curious. Exactly because of the ide of depression portrayed as a black dog. It’s a very interesting literary treatment of depression, Iris. I was already aware of Churchill’s use of the metaphor but apparently Dr Samuel Johnson referred to his melancholic episodes using a similar metaphor in the 1700s – see, you learn something new every day here! I read this at the end of last year and I agree with your thoughts. It was also a surprisingly quick read given the subject I thought. I was intrigued the moment I first heard about this one, but I haven’t got around to reading it yet. Your review is making me even more curious – I think I’ll have to get hold of a copy at some point. Jessica, I thought the brevity was part of its charm as it didn’t get too self-obsessed as some fictionalised accounts of depression can. Glad you enjoyed it too. I think you’d find it interesting, Jackie. It’s not perfect (well, we live in an imperfect world after all!) but I really admired how original it was without being too “clever-clever”. One of the leading depression research institues here is called Black Dog. I’m a bit averse to reading books about depression, but I might give this a go.